William John Droogan was the eldest son of Francis and Catherine Droogan. He was born about 1895 in Ballygawley, County Tyrone. His father worked as a railway labourer. The family lived in Grange, Ballygawley, Tyrone. 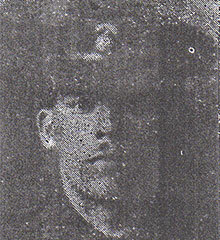 William Droogan enlisted in Omagh. Lance Corporal William John Droogan was serving with the 6th Battalion of the Royal Inniskilling Fusiliers when he was killed in action in France and Flanders on 3 October 1918. He was 23 years old.